Her Majesty Queen Elizabeth II of the UK received for the first time, His Holiness Pope Tawadros II – Patriarch of the See of St. Mark the Evangelist & Primate of the Coptic Orthodox Church on the 9th of May 2017. The meeting took place at Windsor Castle. His Grace Bishop Angaelos – General Bishop of the Coptic Orthodox Church of UK and Rt. Rev. Bishop David John Conner – Dean of Windsor were present for the occasion. Her Majesty and His Holiness discussed topics of mutual interest. Egypt’s Pope Tawadros II appointed on Sunday Theodore Al-Antouny as the new archbishop to Jerusalem and the Near East three months following the death of his predecessor, Archbishop Abraham. The new archbishop to Jerusalem will also be in charge of Lebanon, Jordan, Iraq, Syria and Kuwait. 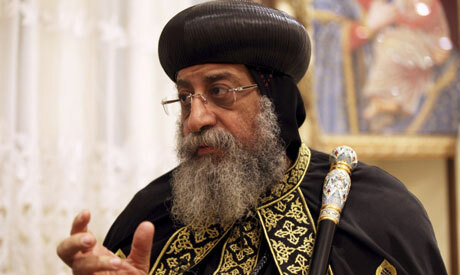 Although the archbishop is usually responsible for 12 additional countries in Asia, Tawadros II said that they will be under the direct supervision of the Coptic Orthodox Church in Egypt. The 47-year-old Al-Antouny, a former pharmacist, was born in the Upper Egyptian village of Abu Tig in Assiut governorate. Pope Tawadros II chose him among other monks to study at the Faculty of Theology in Greece for a period of four years, though he completed only two. The Jerusalem diocese was previously managed by the Syriac Church before the Coptic Orthodox Church started appointing its archbishops. Al-Antouny will be the 22nd archbishop of Jerusalem. In November 2015, Tawadros II made an “exceptional” trip to Jerusalem through Tel Aviv to head the funeral prayer for Metropolitan Archbishop Abraham. The visit marked the first by a Coptic pope to the Holy Land since 1967. On Sunday, 13 November 2014, during the Holy Liturgy at St. George’s Cathedral, Newcastle, H.G. Bishop Antony with the blessed attendance of H.G. Bishop David, and H.G. Bishop Salib, joined together in the Ordination of Deacon Nabil Aziz to Priesthood: congratulation to H.G. Bishop Antony, Father Michael and all Diocese’s congregation . The Church congratulates Mr .Fady and his bride Ereny for their wedding. May the Lord bless them richly and give them happiness and success in building a strong Christian family on Christ, the Rock of Ages. On Sunday 23rd of November 2014, the Church celebrated the Hardo Family, appreciate their efforts and support of the church and we wish the success always. His grace Bishop Antony conducted on the day of the feast of St Machismos the ceremony of ordaining the monk Domatious St Athanasius. All the congratulations for HG Bishop Antony, to the order of the Monastery and to father Domatious, praying for our LORD to grace him with all the blessings ofthe Monasticism. St. Athanasius Monastery, Scarborough hosted the Diocese priests’ seminar during the period 18-21 February 2013. The title was spiritual fatherhood. The seminar was an opportunity for strengthening the communication between the priests. We thank H.G. Bishop Antony for his spiritual meeting. A special thanks goes to the monastery’s monks for their love & hospitality. We ask our Lord Jesus to give them the heavenly reward. Egypt’s Coptic Pope Tawadros II speaks to the Associated Press during a visit to the historic al-Muharraq Monastery, a centuries-old site, some 180 miles (300 kilometers) south of Cairo in the province of Assiut, Egypt, Monday, Feb. 5, 2013. Egypt’s Coptic Christian pope sharply criticized the country’s Islamist leadership in an interview with The Associated Press on Tuesday, saying the new constitution is discriminatory and Christians should not be treated as a minority.